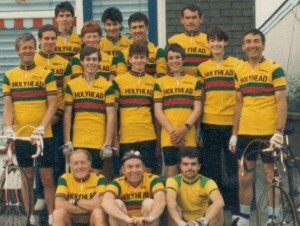 Previous Cycling Clubs existed in Holyhead, on two occasions. The first Club was from 1937 to 1941 and was known as the Holyhead Cycling and Social Club. Meetings were regular, with a Club room near the Town Cenotaph, and Clubruns were held regularly also in midweek and on Sunday’s, with a highlight in the special “cyclists teas” at remote farmhouses. A feature of the Club was the number of “tea dances” that were held, and at the time that was allocated to Table Tennis on Club nights. Sadly, on the outbreak of the War, the Club folded. The Club minute Book is in the Anglesey Archives at Llangefni. There too, is a most interesting photo album of excellent black and white photographs, of the first London – Holyhead Road Race, held in 1951. This album was presented to the late R.V Thomas, a member of the original pre-war club, who by 1951, ran a Cycle Shop in the Town, and who organized the selection of the race from Llangollen to Holyhead. The record for the twenty-five mile time trial to Bangor, and the fifty mile Bangor and back trial, set by R.V Thomas still stands. The results sheets of the events held in May and September 1939 and still in existence and indicate an active involvement by Holyhead riders. 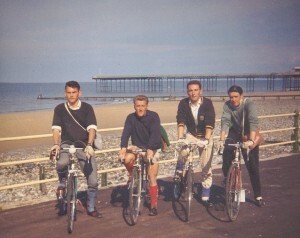 Probably as a result of increased interest in Cycling, following the 1951 race, a Cycling Club was formed in the Town and was active again with regular Club runs, and Time Trials. The fact the London – Holyhead Road Race was held annually, may have contributed to its continued existence until it came to an end in 1957. Glyn Lloyd recalls meeting Percy Stallard, the “Father of British Road Cycling” at the Cenotaph after the latter had ridden a large part of the route from London to Holyhead prior to the 1951 race. There were many Club activities, including a freewheeling competition, quizzes and social evenings in a Cafe in Stanley Street, and nine members went on a ten day tour of Ireland. The Club Rule Book, Membership Cards and Certificates, provide evidence of a well run efficient Club, under the guidance of it’s Secretary – J.O Hughes. Certificates awarded to members for their participation in the Time Trials are also evidence of an active Club. The Club has always been close knit, as the number of members has not exceeded thirty, and all have been involved in a great variety of Cycling activities. Time Trialing, Road Racing and Road Challenge rides. Like many Clubs though, the main-stay has been the weekly Club Time Trial, ranging from ten mile Trials to a hilly twenty-three mile event on the Valley road (A5025), and the “sporting” twenty-five mile event, which is held on the Rhosneigr – Aberffraw – Newborough road (A4080). Club runs are popular in the close season for socializing and training, whilst in the Season, the weekends are for open events on the RTTC and WCU Calendar, though TLI events have been popular in recent years. Recently too, “challenge rides” by the CTC and Audax have attracted a number of riders from the Club. Many riders from the Club have gone on to represent Ynys Mon at the Island Games, with Club member David Williams competing and representing the Country an amazing 11 games. The annual Club Road Race, the first held in 1988 on a course in Holyhead’s Newry Beach, was later held on a circuit in central Anglesey, with the race HQ at Amlwch. The event was a great success, due to the hard working efforts of various Club members, in particular, Keith Thompson who was the organiser of the Road Race for nearly 20 years. The Club will be celebrating it’s 25th Anniversary during the 2007/08 Season. Today, the Club still maintains a small dedicated band of members. Many members participate in Audax events up and down the Country, whereas other members have been successful on the Time Trialing scene. Club members can still be seen today in their recognizable Red and Yellow Strip all over the roads of Ynys Mon and North Wales.